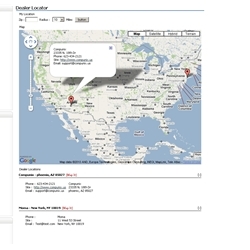 Allow your customers to easily find your dealers with this Google powered locator. Saves bandwidth by caching the Distributor data. Fully customizable with styles, appconfigs and stringresources. Response:Since it uses the Distributor entity for basic information, AspDotNetStorefront recommends a max of 1000 entities per type. However, we do have clients with 1000's even 10000+ dealers running this...it all depends on your server hardware and customizations too. Response:Jim it uses the V2 API and is setup to use the Distributor entity/table by default. However, it could be modified to only use certain Distributor records (perhaps by adding a flag to the Distributor table). This would be a smaller modification than having it use a different table and new interface for that table. - Instructions and readme document included in download. - Installation requires minimal knowledge of ASPDNSF system.